2017 Emmy Award Nominations By the Numbers: Plus, Which Show Just Set a New Record? So little time, so many 2017 Emmy Award nominations. There's serious cause for applause this morning as Anna Chlumsky and Shemar Moore revealed this year's pool of Emmy nominees live from the Wolf Theatre at the Television Academy's Saban Media Center in Los Angeles. From industry newcomers to on-screen legends, the honorees this year come from all corners of Hollywood. While some like Julia Louis-Dreyfus and Kevin Spacey are adding yet another Emmy nod to their resumés, others like Snoop Doggand Shailene Woodley are celebrating a career first. That's right—after two Oscars and two Golden Globes, it's never too late for DeNiro to also take on television gold. In the process of it all, history was made as one show shattered an Emmy count with a record new number of nods this year as dozens of others woke up to the news that they were nominated for not one, but two or three statues this year. 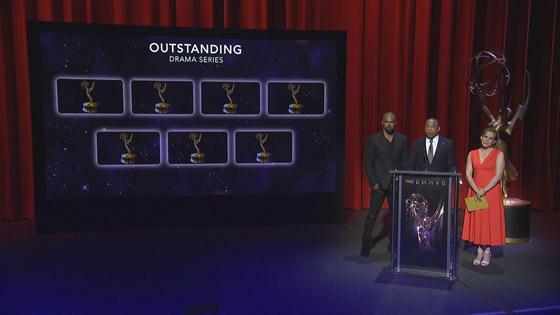 Without further ado, let's break down the numbers of this year's Emmy Award nominations. The Emmy Awards extended welcoming arms to dozens of stars for the first time in their careers. From This Is Us' Milo Ventimiglia and Chrissy Metz to The Handmaid's Tale's Samira Wiley and Alexis Bledel, 43 individual stars earned their first Emmy nominations this year. The nominee pool also featured a handful of movie stars who switched gears to television this year, notably Big Little Lies cast members Reese Witherspoon, Alexander Skarsgardand Woodley as well as The Wizard of Lies' Michelle Pfeiffer and De Niro. To note, this figure does not include first-time nominees in technical categories. Not only did some stars get their first nominations this year, they got double the honor. The Night Of's Riz Ahmed and The Handmaid's Tale's Ann Dowd both collected two first-time nominations while Atlanta's Donald Glover was recognized for the first time this year with not one, not two, but three nominations. Meanwhile, Liev Schreiber also woke up to three nominations this year for his work on Ray Donovan as well as narration work. Meanwhile, Matthew Rhys, Ewan McGregor, Aziz Ansari, Alec Baldwinand Ty Burrell all tied for two this year. So, who leads the pack of nominees this year? It's a tie! HBO's Westworld and NBC's Saturday Night Live are at the top with 22 nominations each. While it remains at the top of this year's pack, Saturday Night Live is experiencing its best year at the Emmy Awards. Not only did it collect 22 nominations this year—the most its ever earned since it was first eligible in 1976, but it also holds the record for most Emmy nominations for a program. Behind SNL, ER is in second place with 124 and Cheers in third with 117. She's the reigning star of Veep and she's on a roll. Louis-Dreyfus secured yet another nomination this year for Lead Actress in a Comedy Series, marking her 23rd career nod to date. If she wins this year, she will tie with Cloris Leachman for most Emmy wins by a performer with 8 statues while also setting a new record for most Emmys won by a performer for the same role in the same series. Age is nothing but a number! In her first year as a teenager, Stranger Things star Millie Bobby Brown secured her first Emmy nomination this year for Supporting Actress in a Drama Series, making her the youngest nominee in the pool this year. The 69th Emmy Awards will be telecast live from the Microsoft Theater in L.A. on Sept. 17 at 8 p.m. on CBS; Stephen Colbert will serve as the show's host. Be sure to follow E! 's coverage on the big night on September 17th!